As a forward-thinking and supportive chamber, the Crookston Area Chamber of Commerce in Minnesota decided to help create and share the narrative of their community. Enter “Belong in Crookston.” The campaign focuses on all the things people can Be in the Crookston community. Get the Big Book of Chamber Ideas for 9 winning ideas from this year’s Chamber Innovation Awards Competition. The initial process began nearly 4 years ago and included many meetings and visits with large and small businesses and partners to learn about their ideas and potential involvement. Additionally, local organizations such as the Convention & Visitors Bureau and City Council took part. It was important that the brand was versatile to fit not only the many activities, groups, and organizations represented, but also to fit as a co-brand of the many businesses and industries. The “Belong in Crookston” brand was decided upon as a group, which ultimately created a community-led effort. 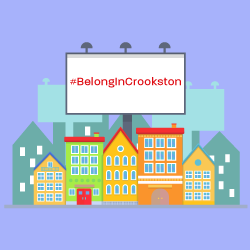 “Belong in Crookston” communicates positive messages about a safe community, affordable housing, and connection to many amenities, activities, and outdoor recreation. It also supports development with key partners such as the local university and state representatives. Check out this video to see the program in action. Be a Kid. Be Adventurous. Be Creative. Belong in Crookston. Download the Big Book of Chamber Ideas. from the world’s most innovative chambers.